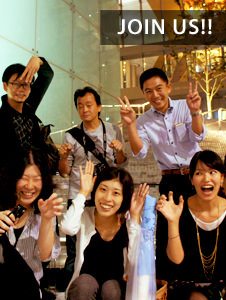 As part of the events held during ArchiFest2009 in Singapore, the Lighting Detectives took a boat ride to observe Singapore waterfront lighting. How does waterfront lighting contribute in creating a space for a pleasant evening stroll along the river? What attracts us towards the waterfront, and how can light help enhance this atmosphere? The ride started from the busy commercial part of the river winding down to a very quiet residential stretch where the Lighting Detectives put up lighting installations. The idea was to highlight derelict zones of the riverscape with the intention to attracting the residents and passersby. Pedestrian bridge was chosen for this. The water edge was also highlighted by using floating lights, handrail lighting and even changing the colour of the street lights from an orange to a blue to complement the surrounding waterscape. Prior to the boat ride, there was a talk on waterscapes and lighting by Mr. Kaoru Mende who showed innovative projects involving waterscape lighting, and Ms. Diane Chua who explained the history and evolution of Singapore River. The talk was moderated by Mr. Siew Man Kok of MKPL Architects. Mr. Siew Man Kok of MKPL Architects moderated the talk between Kaoru Mende and historian Ms. Diane Chua. 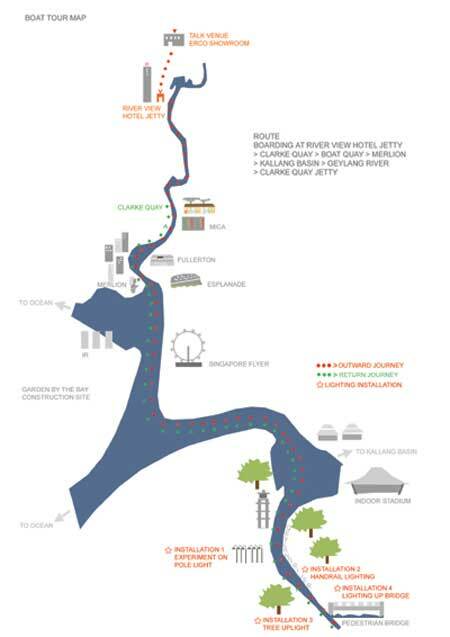 As an authority on the history of Singapore River, Ms. Chua and Mr. Mende discussed the riverfront and lighting. Lighting instillations were set up along the darker residential section of the river. Aluminum foil was wrapped around the hand railing to reflect light. The turn-around-point in the boat tour was the pedestrian bridge across the residential section of the river. Spotlights highlight the bridge supports with accent lights around the planter boxes. Blue filters cover the original lampposts along the river with original handmade shades. 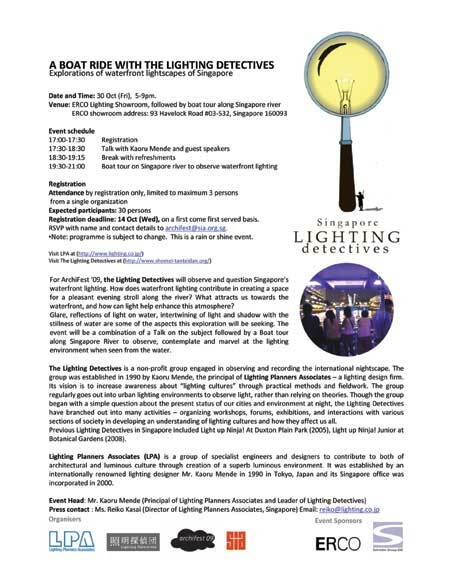 The pamphlet reveals the new Lighting Detective logo designed by, the Singapore Landscape Architect, Chang Huai Yan. The Singapore Night Watching Tour began at the vibrate Clark Quay continuing along the bay area and up the Singapore River to the residential area, Geylang, then back to Clark Quay.